Bart’s a wonderful system. I caught the 6:15 train from Berkeley and by seven o’clock I’m at this quickly little bar/coffee shop in the Mission district of San Francisco called the Revolution Cafe. 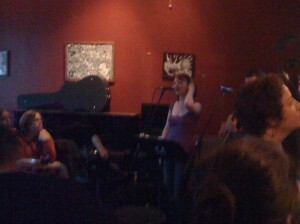 The place was standing room only to listen to a talented singer from Anchorage, Alaska named Marian Call. I found out about her through a CD of songs themed around Firefly and Battlestar Galactica, but her songs (and singing voice) are wonderful even when they don’t have the geek bonus. Best geeky song she played tonight was definitely “Vera flew the coop”, with best non-geeky going to one of her new songs about living in a basement apartment in Alaska, you’ll have to forgive me for not placing the name. I ended up buying a CD in addition to the optional cover charge. It’s so much more rewarding to support artists who are willing to sacrifice for their work, and when the money actually goes to the singer, not a bunch of obsolete middlemen at a record label. The only problem was that the venue so small that I kept accidentally making eye contact with Marian during songs. I have no idea what the protocol is in that situation. Since my solution to break awkward eye contact has always been to take a drink, I ended up going through a fair bit more beer than I would otherwise.